This post is sponsored by Alpha-Bits Cereal. As a member of the Mom It Forward Network I was compensated for my participation in this campaign. The activities and opinions in this post are all mine! Each week we team up with some of our blogging buddies to share activities that help us Move & Learn together. This week I am sharing a simple turkey alphabet race game that is perfect to play if you have any extra time indoors this month or need a fun holiday activity to burn off some energy. We used Alpha-Bits cereal to help us practice alphabet letter recognition while also working on balance and hand-eye coordination. I was sent two boxes of Alpha-Bits cereal for us to check out and use as we created and played this month. My kids aren't huge cereal lovers, though snack on it from time to time, but were super excited to get their hands on this cereal and sort the cereal letters, make words, and spell their names. My kids are also pretty picky eaters, so I am a fan of snacks that they will eat that are healthy and give them some extra nutrients. Alpha-Bits cereal has 20g of whole grains and 12 essential vitamins and nutrients per 30g serving. My son was loving it so much he was two handing the cereal as he shoved it in. Ha! 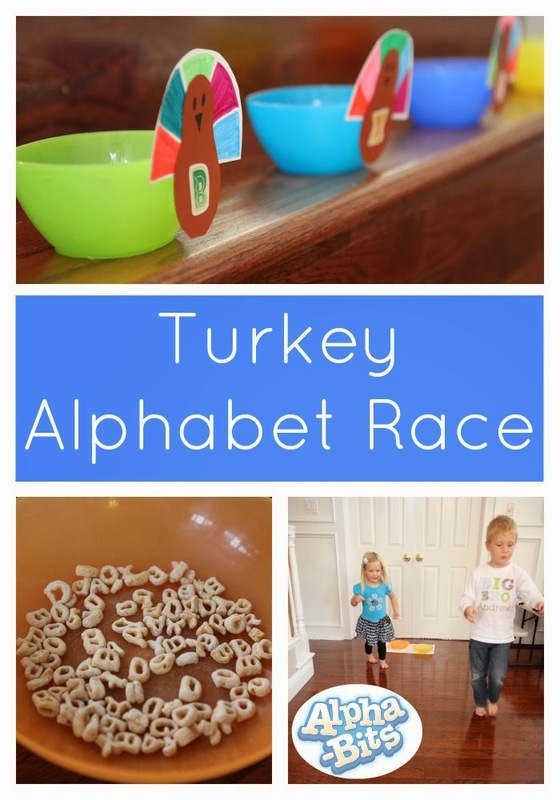 The kids snacked and played with the cereal for a little while and then we created our Turkey Alphabet race game using some quick and easy materials we had around the house. Ahead of time I created some turkey bodies to stick onto the small bowls. Each turkey had an alphabet letters stuck on it. I cut turkey heads from brown paper and then taped on a half circle of turkey feathers to each one. Once the little turkeys were created, I stuck them with tape to the colorful bowls and placed them across the room from two larger bowls filled with Alpha-Bits cereal and spoons. To kick off the game, each kid looked at the turkey bowls across the room and decided which letter they wanted to hunt for. Then they grabbed their spoons when I said "GO!" and then picked up one (or more) alphabet letters and then tried to race across the room to drop the letters in the properly marked bowl. The kids tried to be really careful so that they wouldn't drop the cereal when they were racing... but if they did they just ate it and started over again. It was cute to watch as the kids worked together to help each other fill up the bowls for each letter. Although this was a race, we didn't make it very competitive. The kids had a lot of fun, burned off some energy, and practiced letter recognition all at the same time. This activity was perfect for my almost 3-year-old who is all of a sudden interested in letters. Since this was a a sort of matching game (match the cereal A to the bowl with an A on it) it was pretty easy for her and involved a little visual discrimination... which is actually an important skill to work on as you are helping kids get ready to read. I didn't drill her on the letter name or sound, but occasionally would comment that she was holding the letter A or had just put a letter B in the bowl. My almost 6-year-old already knows his alphabet letters and sounds really well, so while we played this game we talked a bit about words that started with the alphabet letters. For example if he said he'd found a B cereal piece, then I'd say, "ball starts with a B, can you think of any other words that start with a B?" Moms are always talking about how they wish they had more quality time to spend with their kids. This was a simple 15 minute (or less) activity that we did the other day that made me feel like we'd connected. I played the racing game too and we worked together and just had fun. Because I just mentioned the letters (instead of acting like I was quizzing the kids) there wasn't any pressure to perform and the kids didn't feel on edge. I also loved cheering for them while I watched from time to time too. 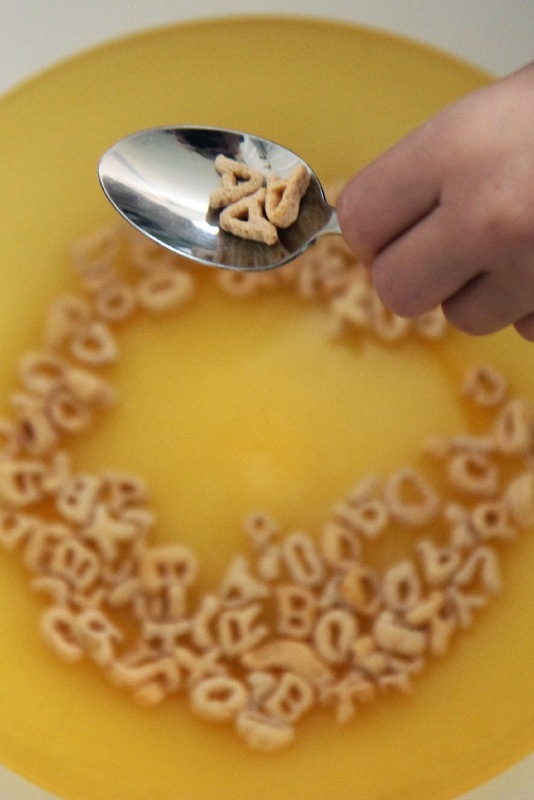 I thought that using the Alpha-Bits cereal was such a great way to make our afternoon snack time fun and educational. Have you ever used Alpha-Bits cereal for learning activities? Do you have any other favorite Thanksgiving or turkey themed activities that get kids moving and learning? 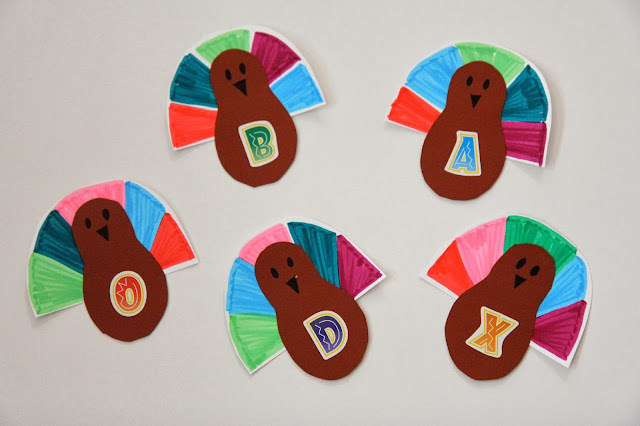 Our Turkey Alphabet Race Game with Alpha-Bits is part of the Move and Learn Series that I am participating in along with Hands On: As We Grow, The Pleasantest Thing, and Coffee Cups and Crayons. I love the idea of racing instead of just sorting by letters. Gets some of that extra energy out! I love this fun, active way to help kids learn letters. Adding this to this week's to do list. Thank you! !